State regulators consider expanding wastewater injection at Livermore oilfield. 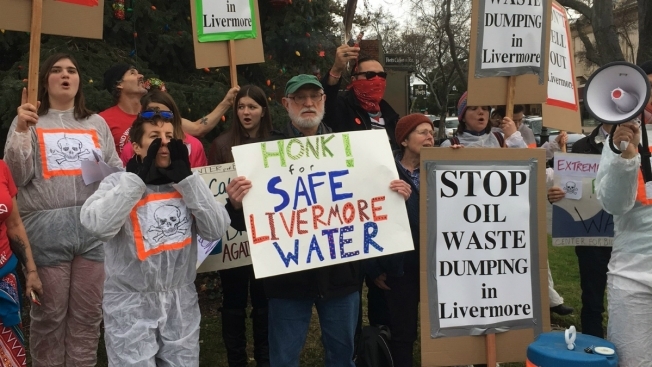 Livermore residents and environmental activists donned hazmat suits and oil barrels to protest the proposed expansion of an oil drilling wastewater disposal site south of Interstate 580. An oil drilling company is applying for an exemption from federal drinking water protections that would let them pump more wastewater into an aquifer. The state oil regulators took comments Wednesday night at a public hearing on a proposal to exempt the aquifer just east of Livermore from the Safe Drinking Water Act. The proposal would “sacrifice local underground water to the oil industry,” said Patrick Sullivan of the Center for Biological Diversity, which organized the rally. Last July, Alameda County banned fracking. Environmentalists lobbied for a stricter ban that would extend to some routine pumping practices that have been used for decades outside of Livermore, but oil companies pushed back. Oil operations in the Livermore Valley don’t involve fracking, which uses pressurized water and chemicals to crack rock formations deep undergrounds to release oil. Currently, E&B Natural Resources has an exemption under Environmental Protection Agency regulations which allows it to inject waste fluids into 25 acres of the 75-acre oilfield. The Bakersfield-based company wants to expand operations to the rest of the site. Company spokeswoman Amy Roth referred questions to state officials. The state Department of Conservation’s Division of Oil, Gas and Geothermal Resources and the state Water Resources Control Board both have to sign off on the exemption before the proposal goes before the EPA. E&B’s current production from the Greenfield Sands area is 30 barrels per day, according to the proposal. Petroleum products were first extracted from the site in 1967. E&B has been operating there since 2008. There is no fracking at the site. “In this area, you don’t need to inject at pressure to break rock formations or add chemicals. You just need to dispose of what comes up with the oil,” said California Department of Conservation spokesman Don Drysdale. That water is brackish, contains minerals and boron, and must be separated from the oil. For each barrel of unrefined oil, a barrel water disposed of, usually by injecting it back into the ground, Drysdale said. To get the EPA exemption that permits wastewater injection into an aquifer, applicants and state regulators have to show that the aquifer has certain levels of dissolved solids, isn’t currently a source drinking water, and will never be used for drinking water. Drysdale said there are a couple domestic wells and a handful of agricultural wells near the Livermore site. He said the closest drinking water well is four miles away and draws from shallower groundwater deposits, while the wastewater would go into a much deeper aquifer. But Sullivan and other environmental watchdogs say they’re concerned about leaks like the one that happened at E&B’s Livermore facility in March 2015. The chemical spill wasn’t promptly reported to the Alameda Co. Environmental Health Department, as required by law, and E&B had to pay more than $10,000 in fines. An NBC Bay Area investigation found that E&B reported 13 spills across the state between 2010 and 2015. Last year, the Center for Biological Diversity filed a lawsuit against state regulators under the state Environmental Quality Act for supporting a similar aquifer exemption application in San Luis Obispo. The EPA is reviewing the state’s aquifer exemption program because of shortcomings in its regulation of protected water supplies. Patricia Scofield, 79, a retired cellist who lives in Livermore, said about a dozen people turned out for the rally against the expansion and many people honked as they drove by. But she was dismayed by how many people spoke up at the hearing to support E&B’s proposal to inject more wastewater into the ground. Scofield said she’s concerned that injecting wastewater increases the risk of triggering earthquakes close to the Las Positas and Greenfield faults.